The line of volcanic isles, known as the Hawaiian Ridge, intersects a line of older volcanoes called the Emperor Seamounts. At this intersection, called the Hawaiian Emperor Bend, these two ridgelines go abruptly in differing directions. Either the Pacific plate or the hotspot had to shift in order to build the new line of isles. In the July 24 online Science, geophysicist John Tarduno at the University of Rochester and colleagues theorize that earth's hotspots can move, and that southern motion of the Hawaiian hotspot, not northern motion of the Pacific plate, formed the Emperor Seamounts. 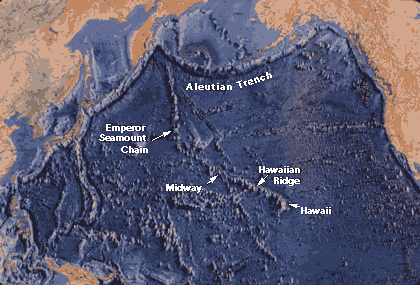 Part of the Pacific Basin showing the volcanic trail of the Hawaiian Ridge-Emperor Seamounts chain. Courtesy of USGS. Tarduno's findings, which Geotimes first reported on in March, could change the entire model of plate tectonics-from how plates move to how land masses form. The paper's recent publication has stirred a new round of debate. Geophysicist Pål Wessel of the University of Hawaii at Manoa and colleagues have written a paper to submit to Nature that refutes many of Tarduno's findings. Wessel has been working on a new motion model of the Pacific plate movements based on a fixed hotspot hypothesis. For Tarduno's theory of a moving hotspot to be correct, the hotspot plumes beneath the Pacific would have to be moving collectively. Wessel says that's not likely but is yet unproven. Tarduno's research is based on paleomagnetic and radiometric age data from lava samples collected during an ocean drilling project. Magnetic minerals within the lava at the Hawaiian Ridge and the Emperor seamounts do not align. If the hotspot had been stationary, the minerals would have corresponded, Tarduno writes. 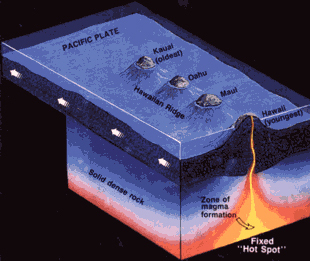 Artist's conception of the movement of the Pacific Plate over the fixed Hawaiian hotspot, illustrating the formation of the Hawaiian Ridge-Emperor Seamount Chain. Courtesy of USGS. Although Wessel does not refute Tarduno's data findings, he does disagree with the conclusions. He and others believe there are better explanations, such as true polar wander (Geotimes, March 2003). "It's an important dilemma that has yet to be resolved. We need more paleomagnetic and radiometric age data from other chains before we can figure out the motion model of the Pacific plate," Wessel says. For now, scientists will continue their research to decode the naissance of the Hawaiian Islands.